The US dollar is going into the testimony of the new Federal Reserve Chair with a distinct softer profile against most of the major and emerging market currencies. The euro is trading near two-week highs, for example, and sterling is near 7-day highs. The Australian dollar is the best performer of the session, up almost 1% and above $0.9000 for the first time in nearly a month. US equities recovered from early losses to close slightly higher on the session yesterday, but this was sufficient to help lift Asian and European shares today. There are a few potential cross-border M&A that are subject to discussion. These include Vodafone in talks to acquire Spain's Ono (estimated price tag ~7 bln euros); Germany's Continental may be interested in US-based Veyance Technology and Nestle is reducing its 30% stake in L'Oreal. Sovereign bond yields are slightly firmer on the day. There are two developments to note. First, Moody's raised Santander's outlook to stable from negative. Second, German sold inflation-linked 5-year bonds today. The break-even rate (spread between linkers and the conventional yield) is just above the year and half low set yesterday near 77 bp. Although new at the helm, Yellen is well known to investors. She helped devise the Fed's current strategy. Stylistically, she rarely strays from message. Speaking officially for the first time since becoming the Chair and in semi-annual testimony is not typically where one would expect new policy to be announced. Yellen can be expected point to the continued recovery of the US economy, with this year's growth estimated (by the Fed) to be near 3%, despite the current soft patch, due to primarily transitory phenomenon (weather and inventories?). 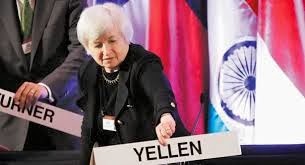 She will defend the gradual tapering path the Bernanke outlined in December. Forward guidance will likely be underscored, which is important given the proximity of the 6.5% unemployment threshold. As Bernanke and others have already said 1) the threshold is not a trigger and 2) interest rates will remain low well after unemployment falls below 6.5%. Given the sometimes parochial nature of US politics, Yellen is unlikely to be peppered with many questions about why the Fed statement did not recognize the emerging market turmoil. If prodded, Yellen will likely explain that the main headwinds to US growth are internal and emerging markets, especially the ones were the volatility is the greatest, like Turkey, Argentina, and the Ukraine, have pose little threat to the US economy. She may even acknowledge that emerging markets have to adjust to changing global economic conditions, including weaker commodity prices, and focus on their own imbalances and governance issues. Investors are still debating the implications of the German Constitutional Court decision at the end of last week. There has not been an adverse market reaction to the 6-2 majority opining that the ECB overstepped its authority in OMT, but sought a preliminary ruling by the European Court of Justice, which is the arbiter of treaty violations. In some ways, because OMT has not been operative, this seems vague hypothetical. On the other hand, the legal quagmire likely rules out some of the bolder initiatives, like QE that some observers have been advocating. The issue likely will become more salient, when/if stress levels rise again in the euro area. Lastly, we see some parallels with Roosevelt's New Deal in the US, where substantial parts were eventually ruled unconstitutional. The other issue that is capturing the attention of investors and the media are reports that show Italian President Napolitano was working behind the scenes for some time to bring Berlusconi down, well before the 2012 and replace him with Monti. Is this really surprising? It may be unsavory, but it does not have significant implications for investors (or Italian democracy). Although Berlusconi often harangued against a domestic conspiracy, he blamed Merkel for his downfall.